Offseason Revamp: What to Expect? Well well well we meet again fantasy footballers. Please understand that being MIA has no reflection of my dedication to this podcast. The season is a very busy time for me researching for this channel. Have no fear! 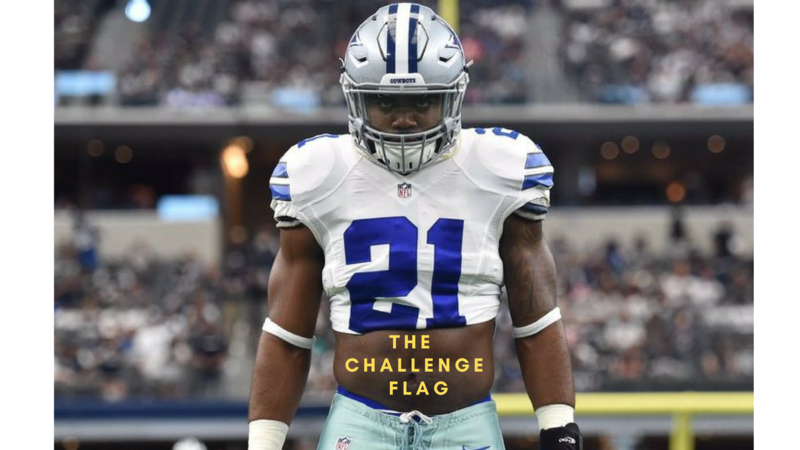 Going forward you can expect The Challenge Flag to be here to stay. We will be an offseason driven podcast that will take attention to detail to the next level. Need that minute piece of information to set yourself over the edge of your opponents for next season? Well then you've come to the right place. Sit back, relax, and enjoy fantasy football like you never have before. 5 min. Fantasy- Don’t Panic! Stick with your Studs. We all do it. We have a stinker of a week and then we re-evaluate all of the off-season research that we did. Countless hours, overshadowed by one weekend of football. In this episode, I break down why you shouldn't panic...yet. In just 5 minutes I break down why Fitzmagic (AKA McGregor's stunt double) may be here to stay, and whether or not you can trust consistent output from the WRs. Early Season Analysis: Who’s Hot? Who’s Not? 1. Patient Paul- He's not gunna freak out after a week 1 dud. Trust your starters man! 2. Panic Attack Peter- OMG MY FIRST ROUND PICK STUNK! I NEED TO PICK UP EVERYONE WHO SCORED OVER 10 POINTS REGARDLESS OF WHO THEY ARE! Before you freak out, or are too lax and miss out on a great opportunity, take a listen to this episode. Mike and I discuss who's gunna stay hot, who may turn it around, and who's gunna stay down in the dumps. ESPN vs. Yahoo! Fantasy Football- Which is More Reliable? "I do"- I will look at accuracy, content, and rankings regarding these two sites. "You do"- This is where my teacher friends would chime in and remind us that this is the most important aspect of this teaching model. Now YOU will be more prepared to assess fantasy football sources on your own, and know what to look for. So my friends, get out your notebooks and pencils. Class is in session. The Challenge Flag is happy to bring you a new series called Fantasy Stocks. As the season approaches, and we see how these players are used (or not used), our thoughts on certain players change. As preseason and training camp continues, Mike and I will be reporting on players who's stock rises and falls in the ADP. In addition, we hope to continue this series throughout the season to update you on important news that can't wait until our weekly episode. Maximize, Maximize, Maximize. Trust me, this is a word that you will be tired of hearing by the end of this podcast. In this episode, Mike and I break down how to properly utilize the Zero RB Drafting Strategy. We highlight when and when not to use it, why it's important to consider, how to analyze league trends, and how to MAXIMIZE (see I told you so) your picks at each and every position. "Welcome to Fantasy Football Ice Cream Shop, what can I get you today?" "Hi! I'll take 3 scoops of vanilla in a cup please." "...Sir we have over 30 flavors." "Don't care! I'll take vanilla." In a nutshell, that's what goes through my mind when I draft a TE. Tight Ends are the vanilla ice cream of fantasy football: bland, boring, and you miss out on so many other great flavors! However, sometimes you can turn vanilla ice cream into a deliscious creation. A Gronk sundae perhaps? Or maybe a Travis Kelce split? Buyers beware; if you turn your boring Eric Ebron vanilla ice cream into something like a Gronk sunday, it's going to cost you. Is the price worth it? In this episode Mike and I discuss this year's TE position, as we dig deep to find some guys who may just give you the cherry on top. Sleepers can win you your fantasy league. Period. End of story. Using a late pick on an everyday starter is huge when developing your championship lineup. Whether you use a TE early strategy or a Zero RB strategy, hitting on those late picks is crucial for everyone. Conversely (oh fancy wording), many early picks don't pan out to be what they were supposed to be and that can cause just as much damage to your fantasy year. Yeah I'm talking to you Amari Cooper! In this episode Mike and I are joined by a special guest to discuss which sleepers and busts are going to affect your fantasy lineups the most. Some people dream about ponies and unicorns. Others dream about winning the lottery, or scoring the girl of their dreams. Me? Well I dream about a day where my fantasy football team is completely comprised of wide receivers. I can see it now: a ten wide receiver starting lineup with no running back or quarterbacks to stand in my way. Unfortunately, this dream has yet to become reality. Until that fateful, beautiful, day I will continue my quest of the ultimate wide receiver lineup. If you too love all things wide receiver, please gather round and listen as Mike and I break down some of the offseason's hot wide receiver topics. Maybe, just maybe, my dream will come true...someday.